The great taste of chocolate chip cookie dough is translated into a delicious truffle filling, then dunked in chocolate and topped with miniature chocolate chips. There are no eggs in this recipe, so these candies are a great choice for the cookie dough lover concerned about consuming raw eggs. If you like nuts, consider adding ½ cup of chopped nuts to the dough to add more flavor and crunch. In the bowl of a large stand mixer, combine the softened butter and the brown sugar. Beat them together on medium speed using a paddle attachment until they're light and fluffy, about 2 to 3 minutes. With the mixer running on low, add the milk and vanilla and beat until they're incorporated. Stop the mixer and add the flour and salt, and mix everything on low until the flour streaks have almost disappeared. Add the miniature chocolate chips, and stir them in by hand, scraping down the bottom and sides of the bowl to make sure all of the flour is incorporated. Line a baking sheet with parchment or waxed paper. Use a candy scoop or teaspoon to form small balls of dough, a little less than an inch in diameter. Cookie Dough Truffles are pretty rich, so these work better as petite bites. Refrigerate the cookie dough balls until they are firm. When you are ready to dip the truffles, melt the chocolate coating. Place it in a microwave-safe bowl and microwave in one-minute increments until melted, stirring after every minute to prevent overheating. Once the coating is melted, use a fork or dipping tools to dunk a truffle in the coating, submerging it completely. Bring it up out of the chocolate and drag the bottom across the lip of the bowl to remove the excess chocolate coating, then place it back on the baking sheet. Repeat with the remaining cookie dough centers and chocolate. 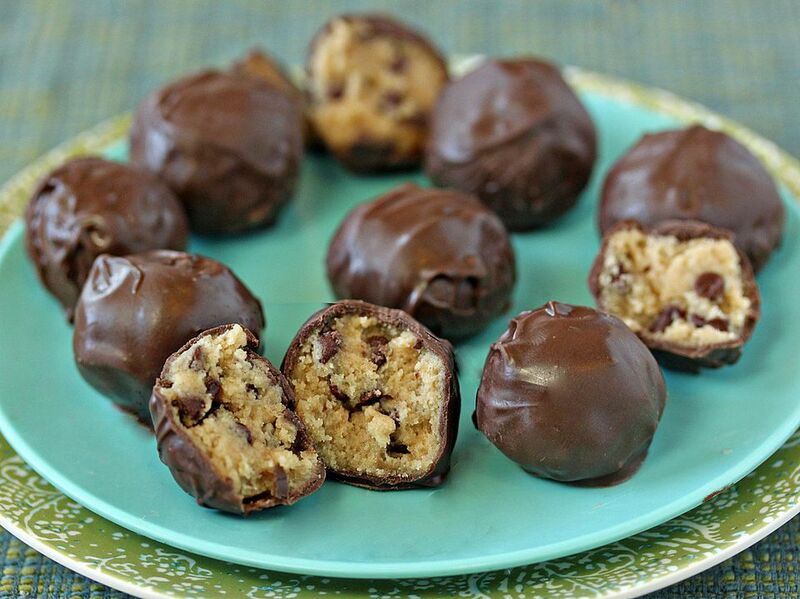 Store cookie dough truffles in an airtight container in the refrigerator for up to 2 weeks.